The first phase of the project in the Pentland Firth in Scotland will include 61 tidal turbines which will supply Scotland with enough power for 42,000 families. Eventually there could be as many as 269 water turbines installed on the array, creating 398 megawatts of electricity. Scotland has a goal of being completely off of fossil fuels by 2020, and this projects puts them on the path to meet that ambitious target. Tidal energy works in a very similar manner to wind energy; in fact, the turbines look very similar. Tidal current energy takes the kinetic energy available in currents and converts it into electricity. As oceans cover over 70% of Planet Earth’s surface, ocean energy (including wave power, tidal current power and ocean thermal energy conversion) represents a vast source of energy, estimated at between 2,000 and 4,000 TWh per year. 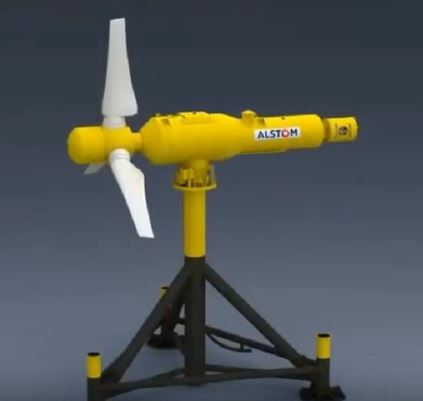 Due to the slower moving blades in water current-powered turbines, it is less likely that they will cause harm to sea life or the surrounding ecosystem. Tidal turbines are much less disruptive to the flow of water than other types of tidal power such as ‘barrages’, which actually trap and release rising tide water.